System Electric is proud to have partnered with Rogers O’Brien on the shell construction services and garage for the Pizza Hut Corporate Headquarters. The project consisted of a 3-story, 177,540 square foot tilt-wall building with steel structure, cast stone exterior veneer and stone veneer accents. Adjacent to the main office structure is a 145,000 SF, 3-level cast-in-place parking garage clad with architectural pre-cast panels. 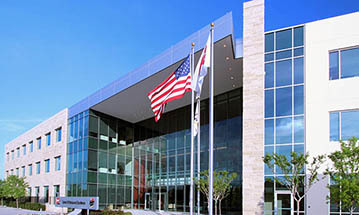 The project included a number of unique features such as child-care facilities, exterior water features, an on-site data center, numerous full-size restaurant test kitchens and mock-ups of the company’s actual restaurants.